Euro-Atlantic integration has become a priority of Ukraine's foreign policy. President Petro Poroshenko on 6 July signed a bill amending some laws concerning the nation's foreign policy course. 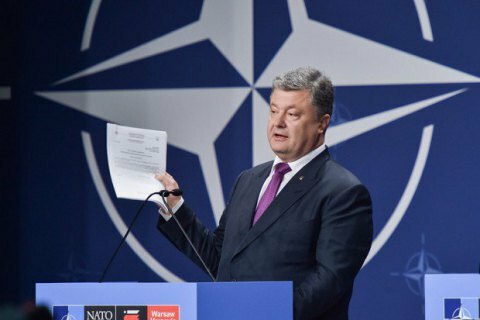 The law defines Ukraine's accession to NATO as one of the bases of foreign policy, the website of the head of state reported. The previous version of Article 11 of the Law of Ukraine "On the Basics of Domestic and Foreign Policy," said that the country's priority was "deepening cooperation with the North Atlantic Treaty Organization in order to achieve the criteria necessary to obtain membership in this organization." Now, the goal of deepening cooperation with NATO will be to obtain membershiprather than just complying with the necessary criteria. The course on NATO accession is also now also set forth in the law "On the Fundamentals of National Security of Ukraine." The bill was adopted by the Verkhovna Rada on 8 June.